Owners of the digital marketing budget and anyone who helps them to spend it! So many search advertisers use AdWords incorrectly and end up spending significant amounts on search advertising each month without being able to justify it. This one mornig will not just teach you the mechanics of setting up and structuring your AdWords PPC campaigns, it will teach how how to optimise it by focusing on prospective customers who can actually convert rather than those who kick tyres! Advertising on Google’s Search Engine Results Pages (SERPs) can be extremely expensive and dangerous for companies who jump straight in! 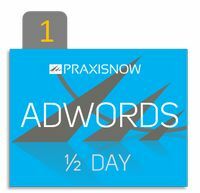 For those who avoid this temptation, PraxisNow’s crash course in Google AdWords is the ideal starting point to get your campaign up and running with minimum fuss and more importantly, profitably. The most successful AdWords campaigns are those which balance Cost per Click with Google’s “Quality Score”. Quality Score is Google’s measure on a scale of 1 – 10 of how relevant it thinks your PPC targeting is. A low quality score results in higher costs per click. A higher quality score results in lower costs per click. But your goal isn’t necessarily to score 10 all the time! AdWords offers you instantaneous presence on the search results pages. Unlike SEO which is a slower burn, AdWords PPC advertising not only gives you this immediate presence, but there is no limit to the number of “keywords” you can target; that may be ten only or a million keywords if you could identify them. The real key to unlocking AdWords is to identify the keywords that deliver conversions for you. Aligning keywords in AdGroups to your AdCopy and your Landing Pages. Deciding what conversion means and adapting your Landing page to deliver it.